We are so excited to announce the return of boy’s competitive gymnastics to Salem! Look at the far end of the gym and you will immediately recognize the new equipment: the ring tower, high bar, pommel horse, and parallel bars. Look closer and you will see dozens of young men developing increased strength, balance, power, discipline, and confidence through the sport of gymnastics. Boy’s gymnastics is back at Salem, and it’s as strong as ever. In the 1980s and early 1990s Salem had a strong boys’ team under the tutelage of Bob Kohut. The team’s Super Star was Chris Young, a natural athlete and strong competitor who won National Gold in his Salem uniform (see his name hanging on the Salem Gymnastics walls). 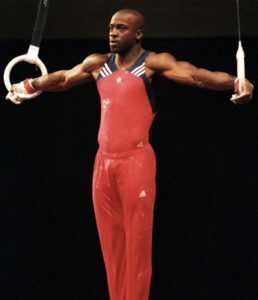 Chris continued gymnastics at the University of Minnesota and then on the US National Team where he won international medals and competed in the 2000 Olympic Trials. After retiring from competition, Chris became part owner of a gymnastics school and began a successful coaching career. Chris has long been known for his humor, loyalty, and dedication to excellence. He returns to Salem with his longtime assistant coach, Edwin Maffiold, bringing boy’s gymnastics back to his gymnastics home and sharing his love of this sport with a new generation of young men. All levels of classes and team are now offered, from beginners through the national level. New students are welcomed every day. Are you interested in getting your son involved in gymnastics at Salem? Visit salemgym.com for complete information and get him started today. Salem Gymnastics & Swim ~ Where Confidence Soars!